Comments: Don Menzel was a good steady runner at Flemington first in Sportsman and then as a modified runner for a while. 05/23/03 Kevin B. That's true , and Don had even a nicer modified. 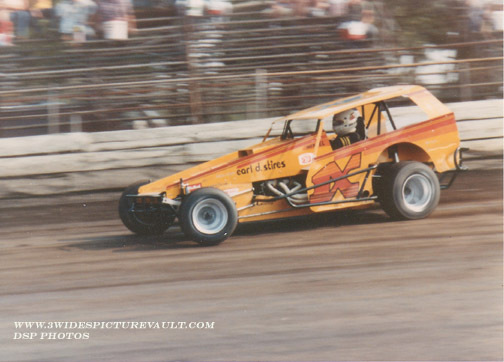 I can still hear that famous ( Bitner) Big Block sound,remember those other great sounding engines the likes of the Deblasio # 5, Trenton Mack # 74, also listen to Mark Bitners car on the end of the back stretch at New Egypt. 07/08/08 Johnny Snyder Wow, I couldn't believe when I was looking through these old pictures and the 1X of Don Menzel and George Stires popped up! Don was a great driver in his day. It's a real shame he gave it up! He actually had talent. I actually grew up 2 houses from Don back when we were kids back in the 70"s and 80's. I really miss those days at Flemington. Just for clarification the 1x in the photo was Don's first year in Modified and it was a small block bitner that year; no big deal. Later they did get an awesome Bitner big block. To my knowledge Don still lives in Hopewell Twp. NJ.